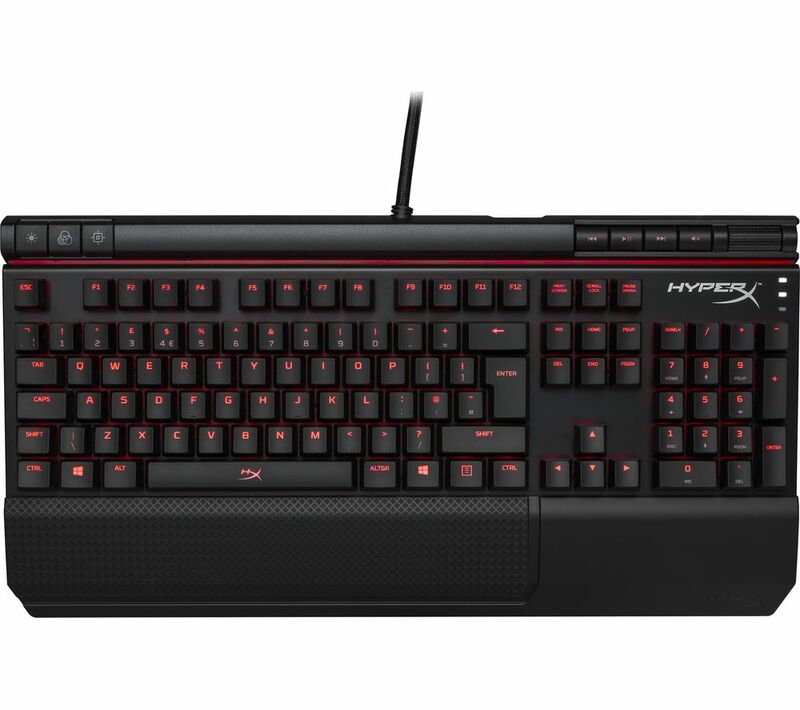 Overview & specs of Hyperx Alloy Elite Mechanical Gaming Keyboard by Currys PC World. Top features:- Dynamic lighting effects illuminate your gaming experience- Highly responsive CHERRY MX keys for proven reliability- Multimedia keys for easy playback and volume control- Detachable wrist rest so you can play in comfortDynamic lighting effectsPlay your games in style and comfort with the HyperX Alloy Elite Mechanical Gaming Keyboard. It features dynamic lighting effects that illuminate your gameplay with its dazzling backlit keys, and an 18 LED light bar that brings the keyboard to life.Highly responsive CHERRY MX keysWhen playing your favourite FPS games, you'll want a keyboard that offers extreme reliability and accuracy. The Alloy Elite has CHERRY MX keys give you that. They're built for high precision, unmatched reliability, and minimal actuation force - which means less joint wear and greater comfort during marathon gaming sessions.Multimedia keys for easy playbackMultimedia keys let you control your media at your fingertips - that means no fumbling around trying to find keys to skips tracks and change volume. You've also got quick access buttons to the keyboard's lighting effects and brightness for quicker customisation.Detachable wrist restA detachable, comfortable wrist rest reduces strain, and provides extra comfort during your longer gaming sessions. We are comparing prices for Hyperx Alloy Elite Mechanical Gaming Keyboard in new condition sold by Currys Pc World, Argos.